The Muscular Dystrophy Association today announced the launch of a multifaceted digital awareness and fundraising campaign to kick off its new “Live Unlimited” movement. The six-week campaign will include unique #LiveUnlimited stories, an online celebration of music with performances on Facebook Live and a 24-hour online gaming event. It will use the social megaphones of support from MDA families, celebrities, artists and digital influencers to inspire Americans to share their personal #LiveUnlimited moments. 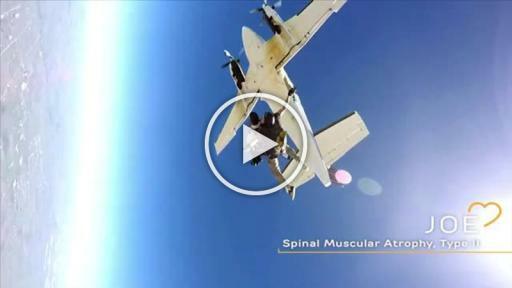 The idea behind “Live Unlimited” is inspired by the strength, courage and can-do spirit of individuals and families who are doing remarkable things every day to show the world that the physical and societal limits diseases like muscular dystrophy and ALS bring will never define them. 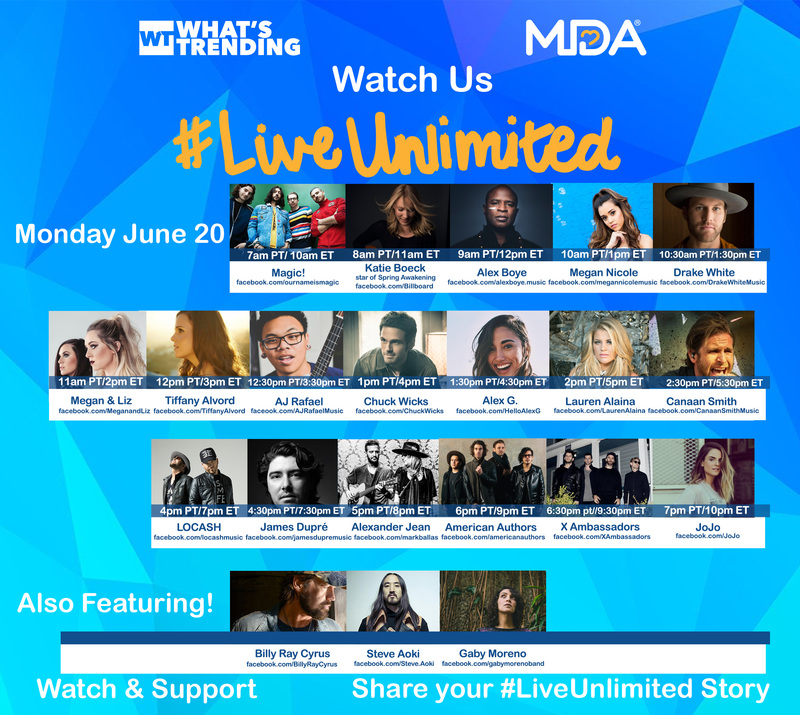 MDA’s “Live Unlimited” campaign kicks off today with a 12-hour celebration of music. 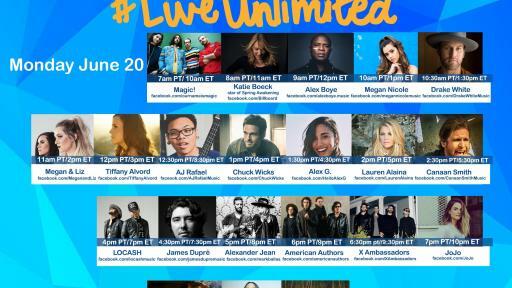 In partnership with popular millennial media brand What’s Trending, from sunrise to sunset, artists, including X Ambassadors, Billy Ray Cyrus, JoJo, American Authors, Magic!, Steve Aoki, Megan Nicole, Lauren Alaina and many more boasting millions of social followers, will livestream special “Live Unlimited” performances on their own Facebook pages. Also starting Monday and continuing throughout the campaign, celebrities, artists, athletes and digital influencers — including Carly Rae Jepsen, Ernie Johnson, Mario Lopez, Nancy O’Dell, Olympians Shannon Miller, Nadia Comaneci and Bart Conner — and MDA’s network of families and friends will also share how they #LiveUnlimited in their own words. A majority of survey respondents (57%) say they have faced a limitation that has made it very difficult or impossible to do something they wanted to do. The most common limitation cited was financial (58%) among those who said they have faced limitations, followed by lack of self-confidence (38%), physical limitations (37%) and fear (32%). Fewer said they have faced limitations because of their educational background (24%), professional status (17%) or mental abilities (15%). When it comes to defying the impossible and overcoming limitations, the vast majority (82%) of those surveyed believe in the power of support and encouragement from friends and family more than they do in new research and technology (70%). Even more (87%) feel that if you have enough drive and willpower, you can overcome almost any limitation. Two-thirds of consumers (65%) say they have done something they once thought was impossible. Share how you #LiveUnlimited on mda.org. Create a unique "Live Unlimited" graphic that can be customized and uploaded to social to show the world that limits don’t define you. Join the 24-hour LIVE online gaming and variety show event on June 24th: in partnership with Geek & Sundry and Smart Girls, MDA will participate in an all-day and night game-athon from June 24—25 on the Geek & Sundry Twitch Channel. Viewers will tune into games and variety acts featuring special guests and talent from both channels. The call-to-action for gamers will be to donate to MDA and donations will be incentivized through games, giveaways, special shout-outs and much more. Purchase a special-edition "Live Unlimited" bracelet at www.endorphinwarrior.com/live-unlimited. A portion of the proceeds from each bracelet sold will go directly to MDA. Musical.ly, the video social network for creating, sharing and discovering short music videos will do a #LiveUnlimited launch day takeover and will be featuring select videos that include the hashtag. From June 20 through July 31, a generous sponsor will donate $1 for every #LiveUnlimited moment shared at mda.org/LiveUnlimited. The “Live Unlimited” Launch Day is made possible by MDA national sponsor National Seating & Mobility (NSM). For additional information, please visit mda.org/LiveUnlimited. *Survey Methodology: The Omnibus Survey was designed by Edge Research in partnership with MDA and fielded by OMNIWEB using the KnowledgePanel ™, a national online omnibus service of GfK Custom Research North America. The KnowledgePanel™ is the only commercially available online probability panel in the marketplace; making the sample truly projectable to the US population. The sample for each wave's KP OMNIWEB consists of 1,000 completed interviews, made up of male and female adults (in approximately equal number), all 18 years of age and over. All completed interviews are weighted to ensure accurate and reliable representation of the total population, 18 years and older. The survey was fielded April 29-May 1.